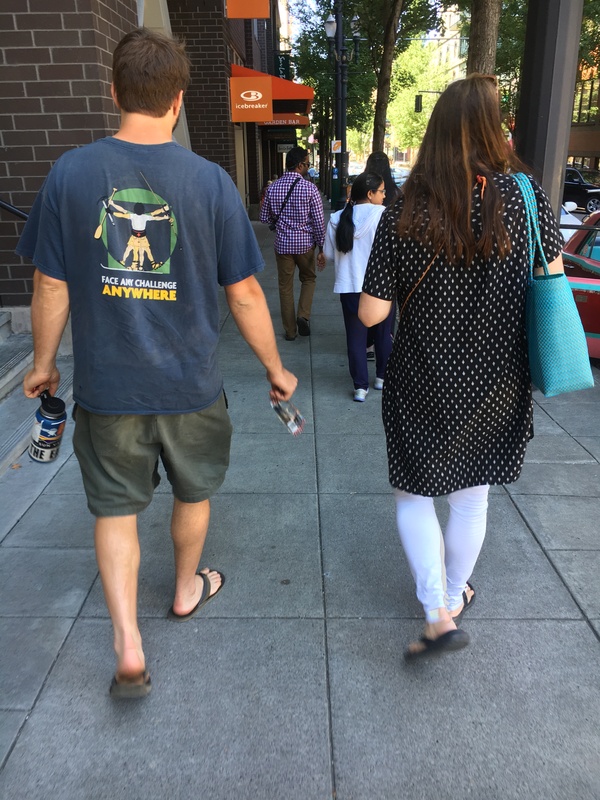 The first installment of my PNW travel blog left us off in Olympia, ready to head southward towards California, where we were to meet up with Win, my son (and Maggie’s big brother), and his girlfriend, Heather. We road-tripped down Rt. 5 making several stops along the way. And no, not all of them were for espresso drinks. Fabulous and unexpected Mexican lunch in Eugene, OR. Mama Mayra has 5 stars on Yelp, all of them deserved. Definition of hole-in-the-wall, suffused with fragrant cooking aromas, smiling diners chowing down at worn linoleum tables. 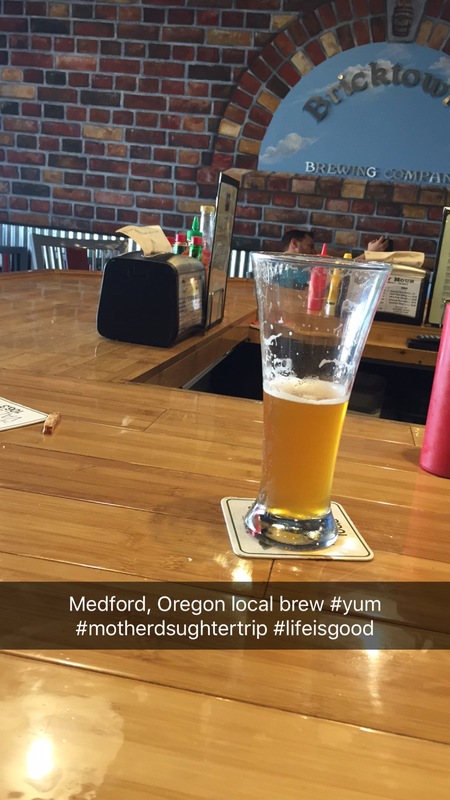 Bricktowne Brewing Co. in Medford, OR. Don’t hold the “e” at the end of “Bricktowne” against them. 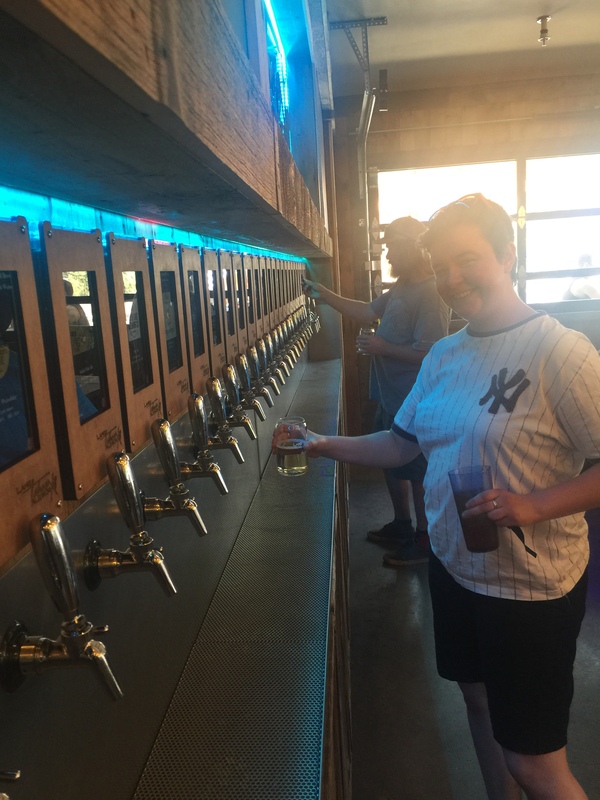 The beer was good, and Maggie loved their dry pear cider. 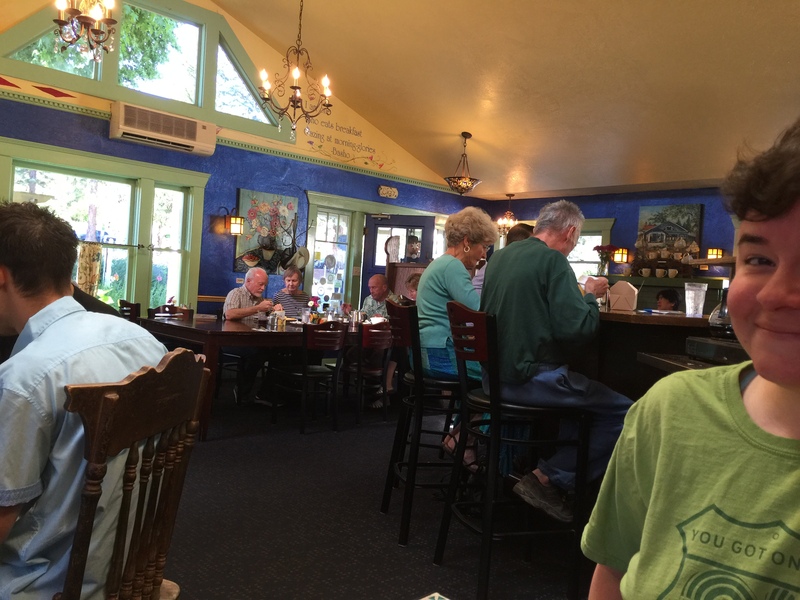 The best breakfast place ever in the history of history— Morning Glory Café in Ashland, OR. This place had a menu so delicious and creative, a décor so campy and cozy, servers so sassy and efficient, that we are seriously considering a move to Ashland for the duration of life. The glories of Morning Glory cafe. We arrived in Placerville, CA by evening of our second day of driving, after stopping for groceries. Our arrival, and the much-anticipated bear hugs from the bear-of-a-son (I was prepared for his bear-like-appearance), took place in 109° heat. But the heat was incidental. 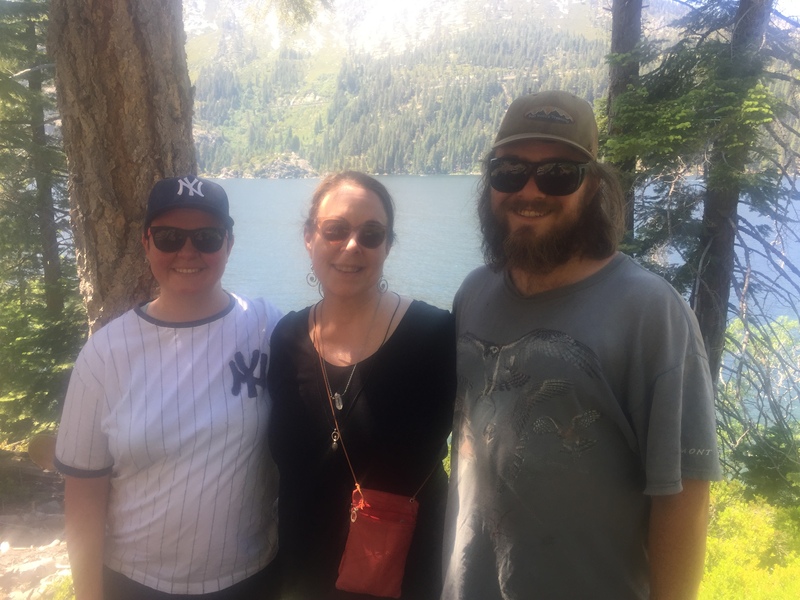 What mattered was the warmth of being with both my children at the same time for a whole week. Slipping back into the on-site mother-groove and letting the flow of talk and laughter fill me up. The Maggie and Win show is always fun to tune into…. I felt blessed to be able to see through a small window into the life shared by my son and the woman he loves (beautiful, vibrant Heather). For three of the days I was able to stay with them and see firsthand the easy, intimate rhythm of two people who love and support each other. The fact that one of them is my grown child made it especially meaningful for me. 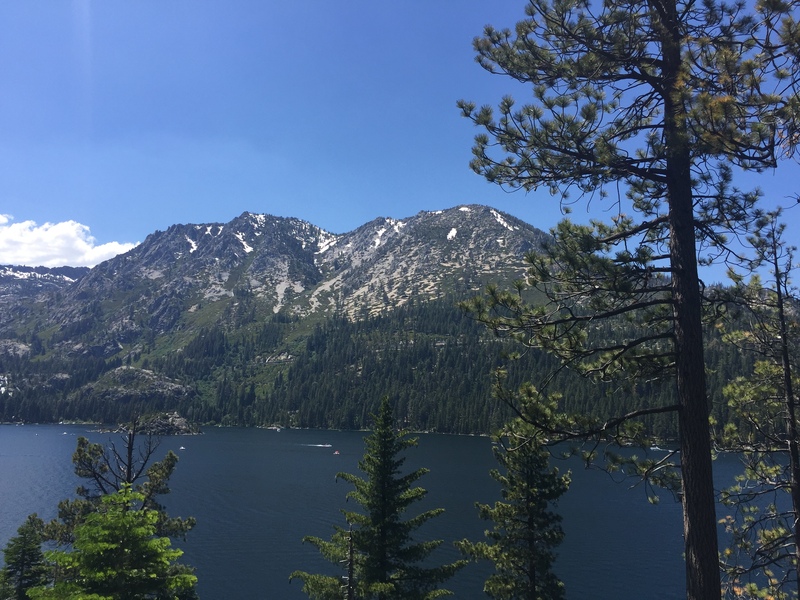 Visit Lake Tahoe. 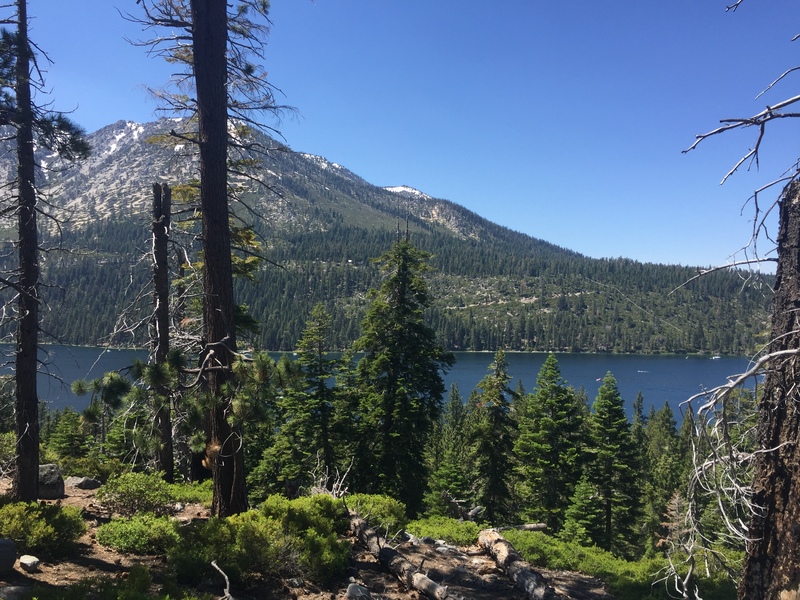 I’ve been collecting possible words that I can use to convey the impact of Tahoe on my brain/psyche/soul. I came up with this one: WOW. The three of us (Heather was working) had a little picnic, took a short hike around (part of) the lake’s perimeter in the 100° heat (with lots of looking-at-the-view stops), then went somewhere to drink a cold beer. This was the “cold beer” part of the day. Wine tasting. Heather was not having a good day that day. 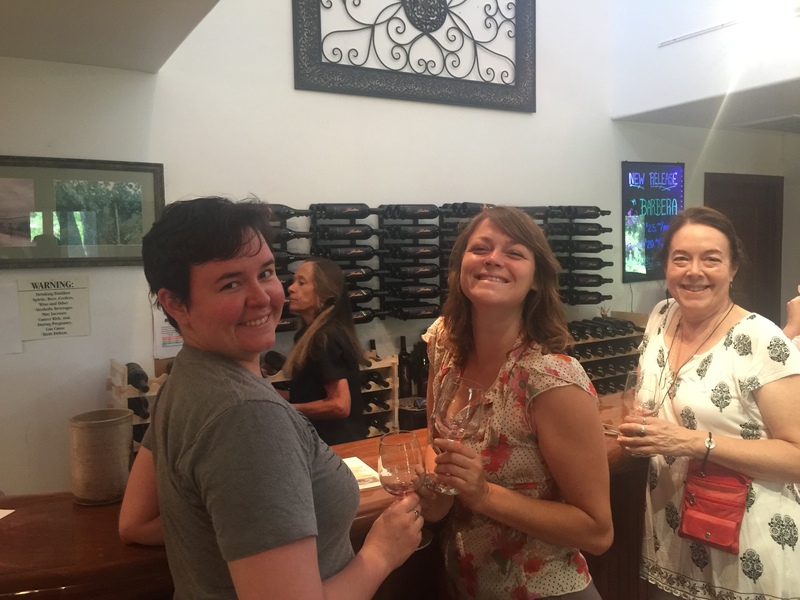 It got notably better when we started puttering around to a few nearby wineries and tasting their honorable wares. Turns out that Napa is not the only county in CA with a zillion superb wineries. Within 5 miles of where we were staying there were 20+ we could visit. We checked out about 5. Our favorite was Jodar. Of all that we visited, the people were the most real, the wine the most delicious, and the atmosphere the most jovial. Plus, geeks that we are, we learned the most and liked that. Side note: as Heather, Maggie, and I sipped wines and nibbled cheese, Win hung out either outside or in a nearby arm chair, depending on where we were, reading fly fishing articles on his phone. The Haircut. 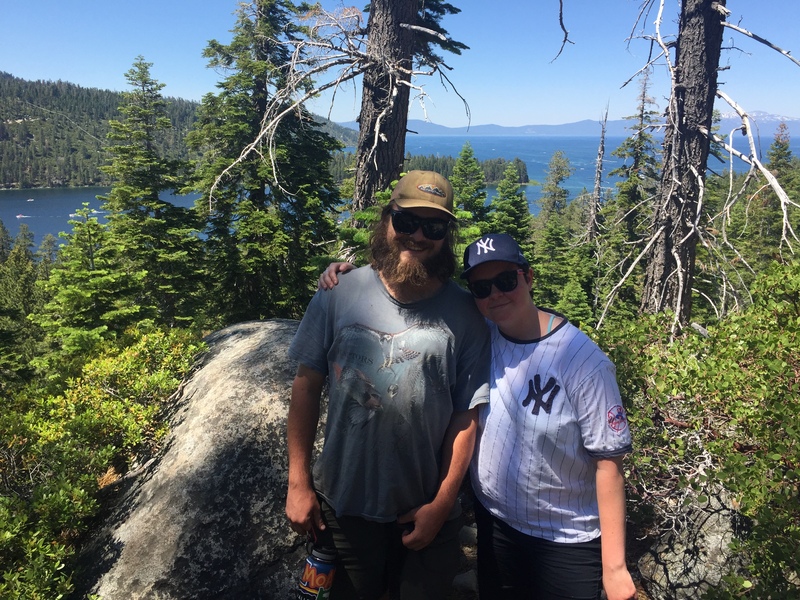 When we first arrived in CA, we saw firsthand what no scissor and no razor looks like on my son for 7 months. Remember Jeremiah Johnson? Or maybe Forrest Gump on his cross-country trek? Like that. And in temps pushing 110°. 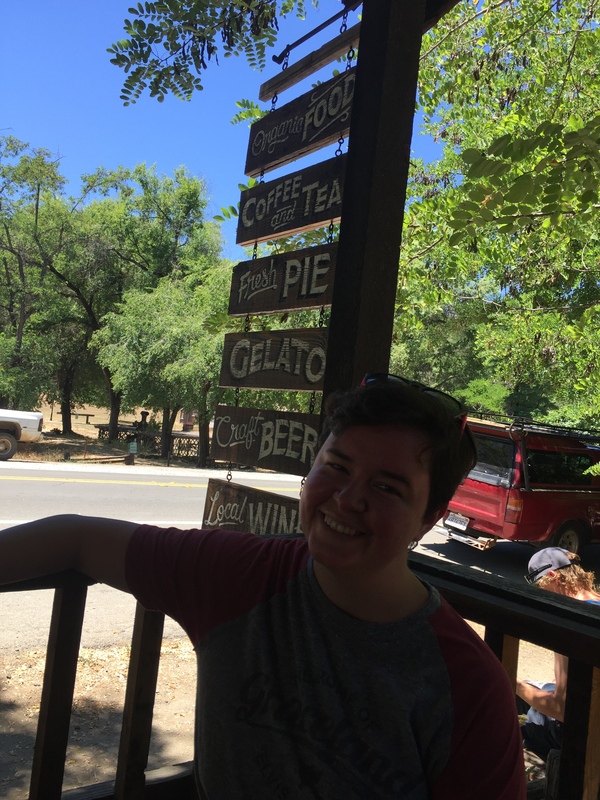 Win: “Yeah, I’ve been meaning to get a cut.” ENTER MOTHER (wearing imaginary cape, hovering five inches off the ground with hands on hips): “To the rescue!” So, the day we visited Nevada City, CA, we stopped off at a barber shop on the outskirts of town. When the four of us (all rather tall humans) poured into the little shop (we left the dog outside), the barber was unfazed. She proceeded to cut an elegant swath through my son’s hair collection, moving it from his head and face to the floor at her feet. Pre-cut, in car with the gang of us including Stella the bestest dog ever. 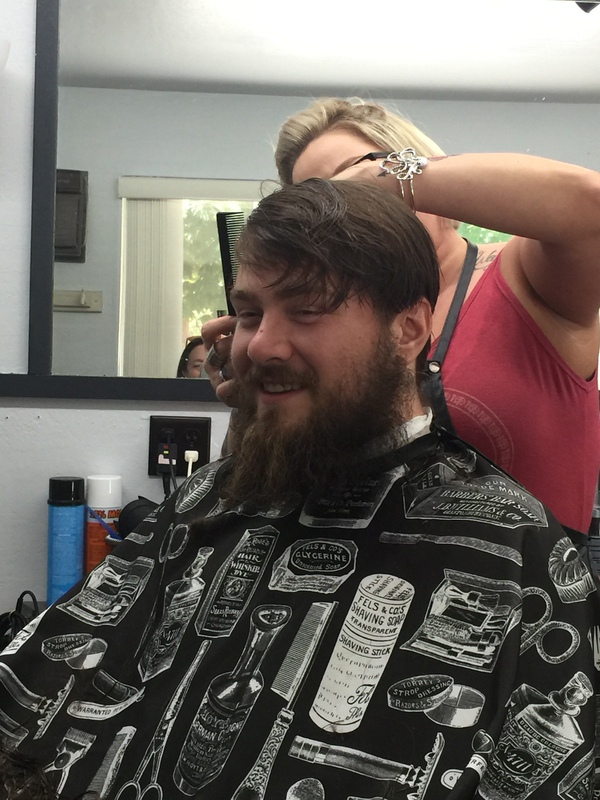 Mid-cut with the unflappable barber. A woods-walk on the Deer Creek Tribute Trail near Nevada City. 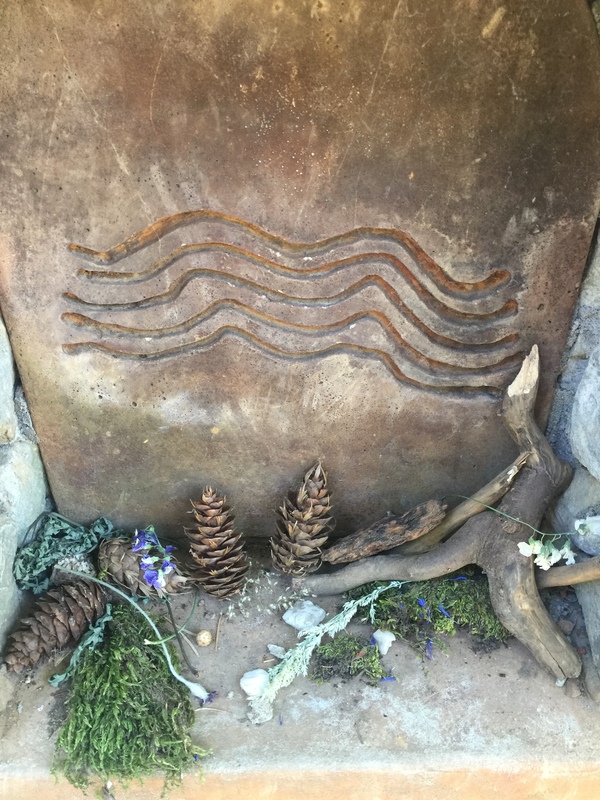 Beautifully maintained by locals and with gorgeous retaining walls, artistically designed, including niches where people have created community altars to nature. One of two altars with additions by us. 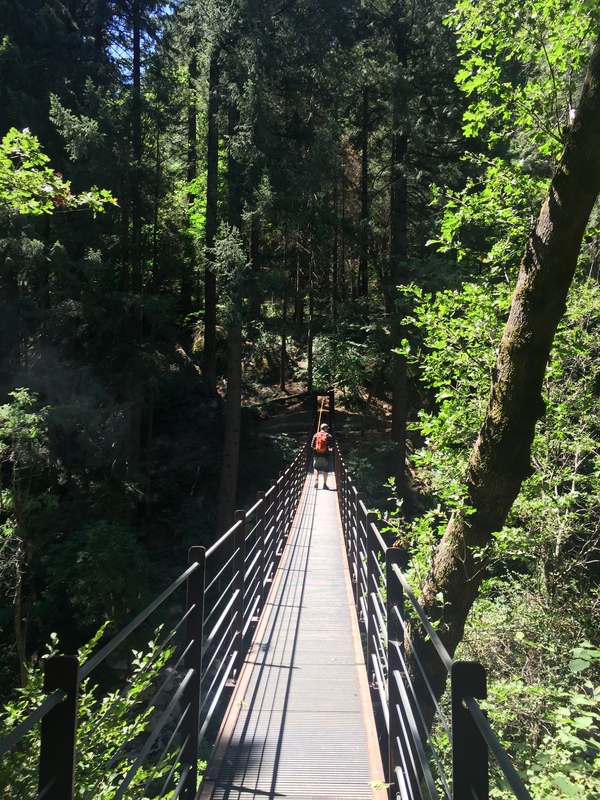 Suspension bridge on Deer Creek Tribute Trail. Geeking out about gold rush history. 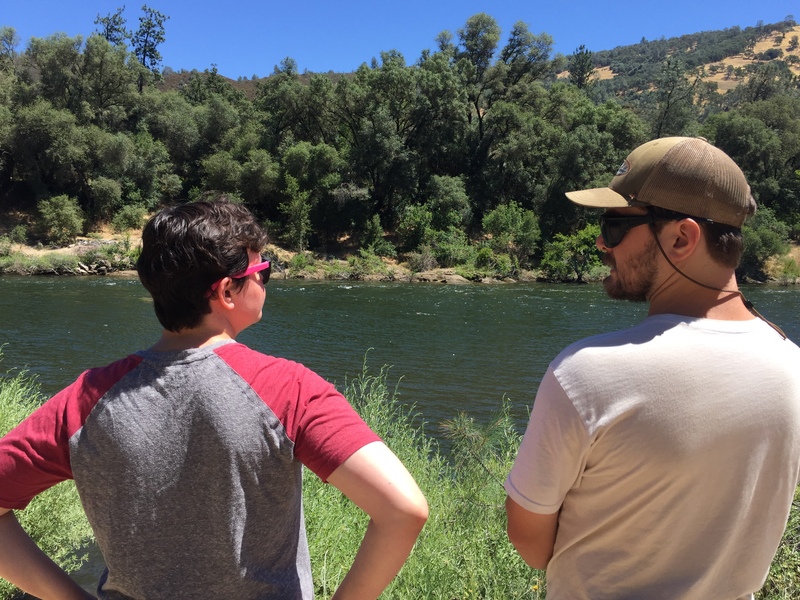 The “kids” and I headed to Coloma, CA, location of Sutter’s Mill, the site of the first gold nugget discovery by James Marshall (1848). 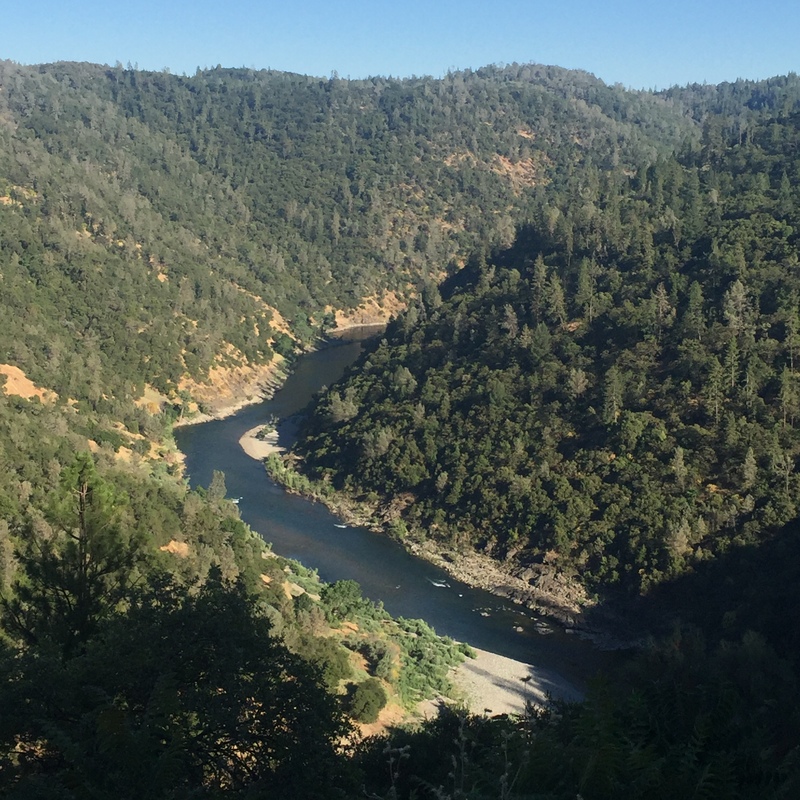 The South Fork of the American River flows gloriously by the spot where a saw mill was created. Soon the non-existent town, and the area of CA that was home to around 150,000 Native Americans, was flooded with white men fixated on quick wealth (a tale as old as time), and about 120,000 of the rightful residents were utterly wiped out. The blip in the road that is now a few historic buildings and a little museum was, for about 8 years, a thriving metropolis. 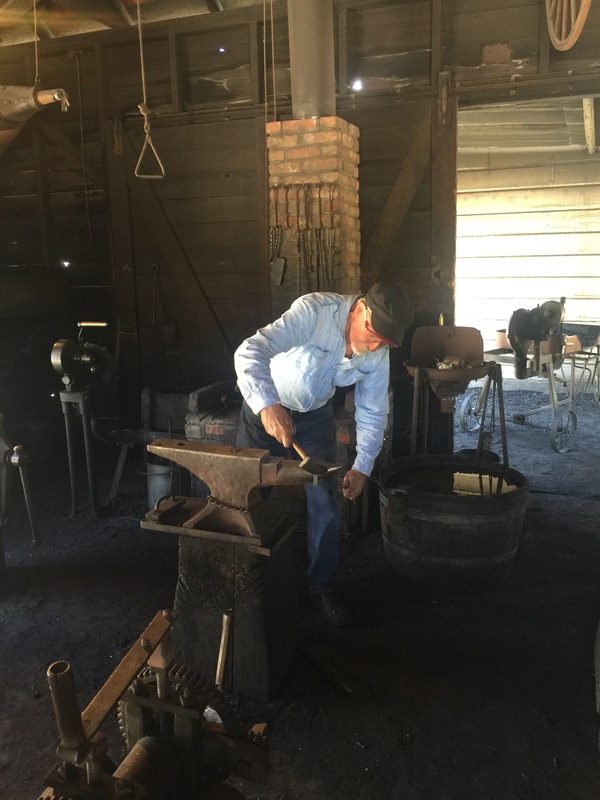 Highly knowledgeable and skilled blacksmith at Coloma. Super cute lunch place in the heart of this “birth of the gold rush” area. 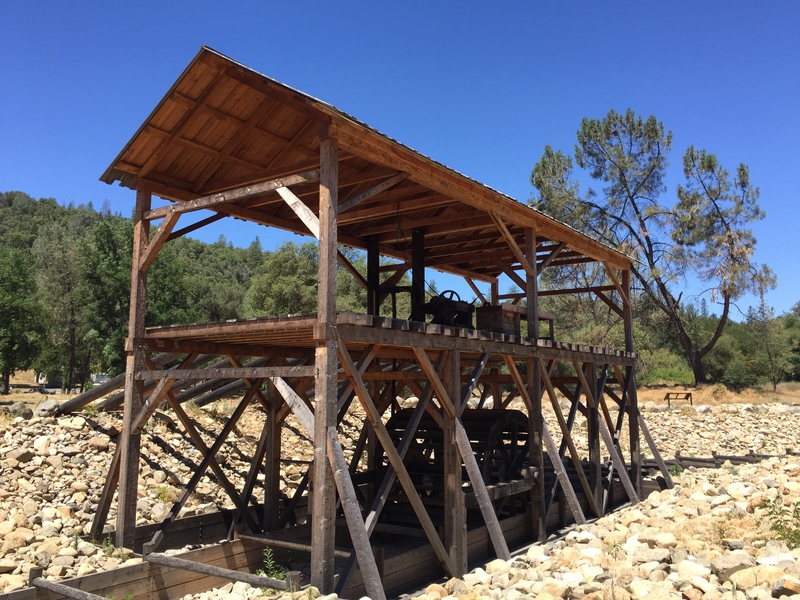 Recreation of Sutter’s actual mill. Having a beer with a former student of mine at The Club Car in Auburn, CA (forever memorialized for me now). He and his wife are ranchers dedicated to sustainable animal husbandry. 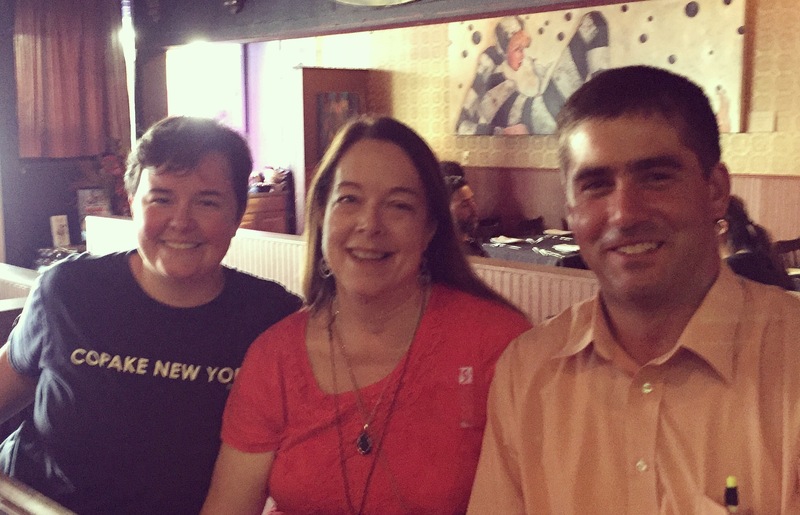 We sat at the bar, sipping local beer and talking about ranching, the environment, the school with which we all share a history, Gareth’s kids (small, lively, and brilliant and whom I’ve not met), my kids, who were in 3rd grade and kindergarten when Gareth graduated. It was joyful. An hour and a half passed and we parted with hugs all around. 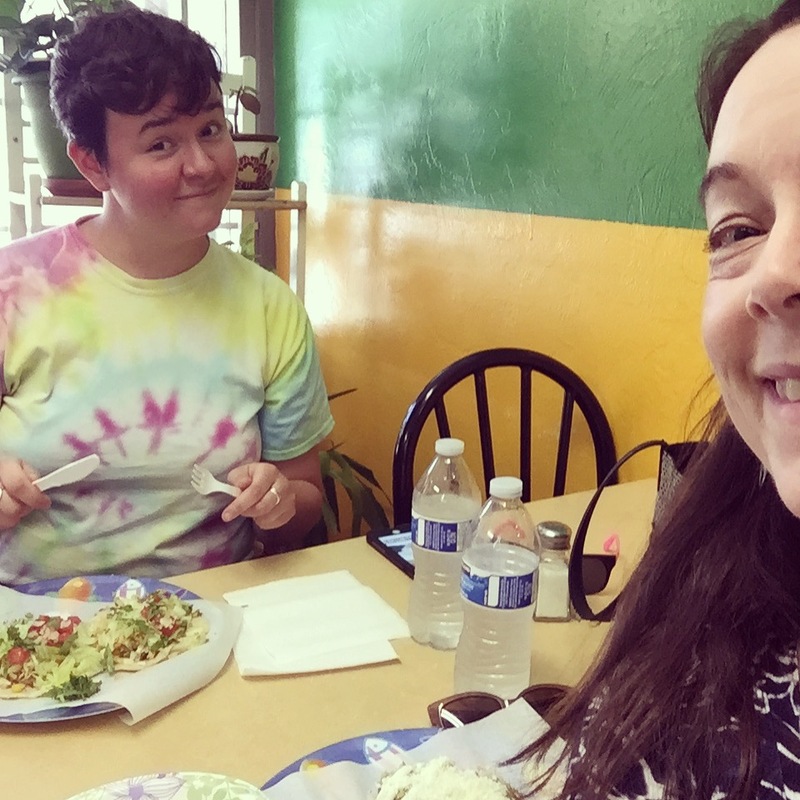 The best part of any trip can happen between the “things we do.” This mother-daughter trip was across the country but we also logged over 1700 miles getting from Seattle to our meet-up with my son, plus about 2-300 additional miles exploring together once we got there. 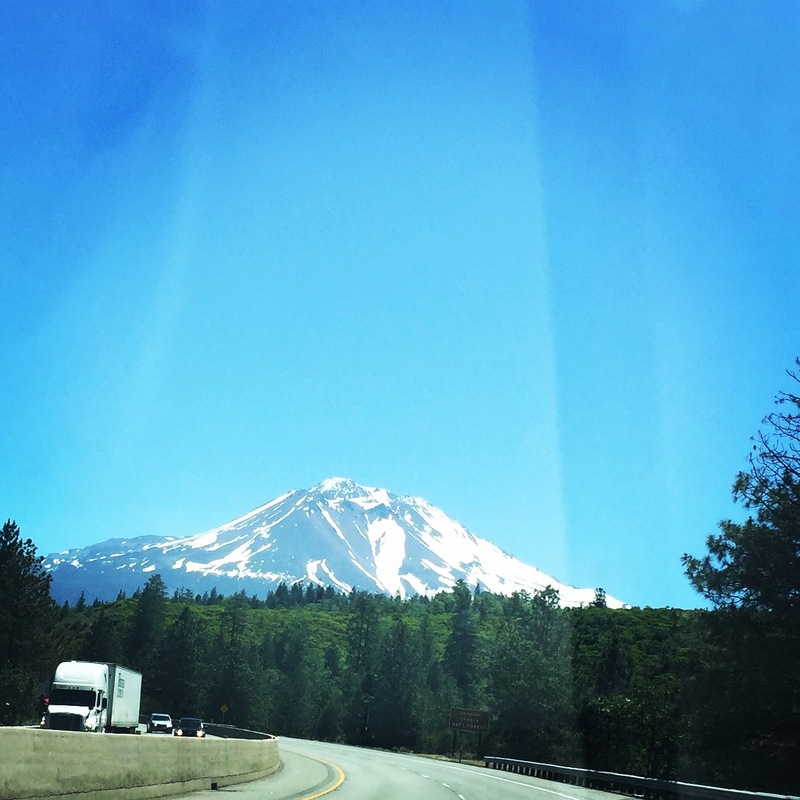 The hours in the car included some of the most beautiful views imaginable. Plus lots of fun scoping out coffee shops on Yelp and going out of our way to hit them. And then we read one and a half books (I read to Maggie while she drove –neither of us ever outgrew read-aloud). 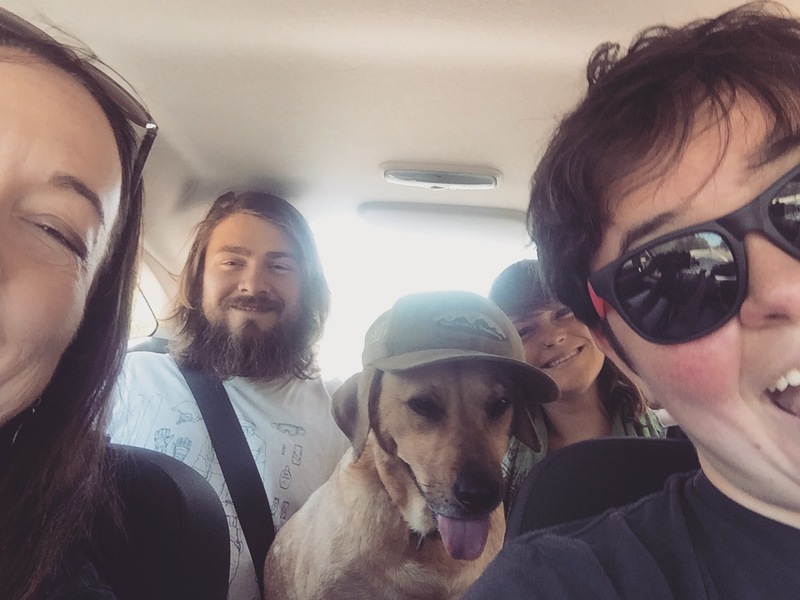 When we were tooling around with her brother, and Heather too sometimes—plus don’t forget Stella the dog—it was like a magical car-based opportunity to … well, talk. Then there was the talk-while-walking-around-random-towns, the talk-while-exploring-nature, the talk-while-eating, talk-while-cooking, talk-while-shopping, talk-while-sitting-around-and-forgetting-what-we-were-supposed-to-be-doing, and so forth. Not at all sure that wasn’t the best part of the whole trip. 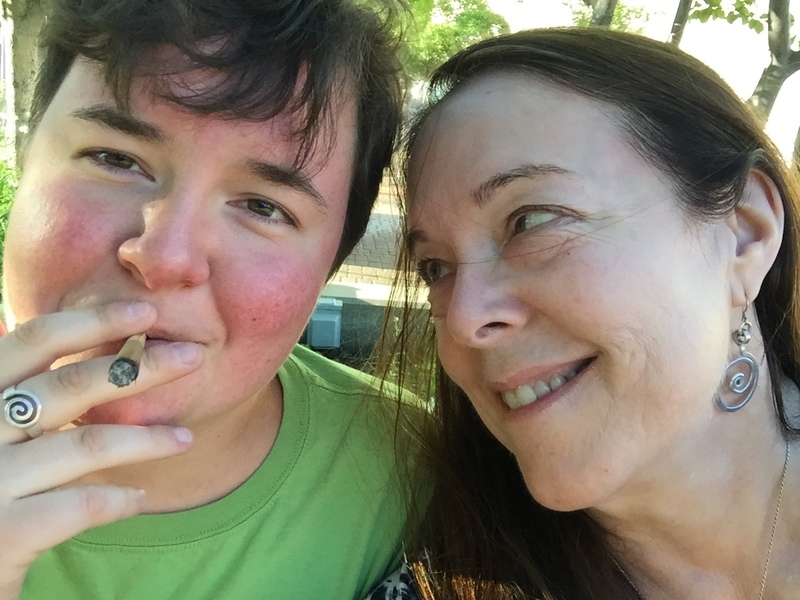 But eventually daughter and mother headed back north, with plans to meet up with Win (and maybe Heather) again in Portland just before July 4th and our flight back. The last chapter of my PNW blog will be posted very soon….